Mum of Five Staying Sane: Spent too much for Christmas, time to wrap presents & decorating the house! Spent too much for Christmas, time to wrap presents & decorating the house! As we are all watching it at the moment I'm going with a theme, 'I'm a Mummy, GET ME OUT OF HERRRRREEEEEEE'! Yes, it's one of those weeks. Only one month until Xmas, present buying is looking good, still got a bit to go but overall I'm pleased with progress. However, I've now put myself on a spending ban for the next week or two so I need to occupy myself and keep myself away from shops, the internet and Costa Coffee!!! So, the plan is that by the end of this week the house will be spotless as I will have been stuck in the house 24/7, apart from my usual Tuesday night pub quiz, I can't miss that! I also plan to have most, if not all, of the Xmas presents wrapped. That means I have to buy some sticky tape, is that allowed on a spending ban or should I have given myself an 'essentials only' pardon?!! This also leads us into the weekend and Sunday 1st December, advent calendar opening day and decorate the house day. No Christmas tree until the weekend after otherwise by Christmas Day it usually looks like a wilted mess and very sad! The children are excited to get all of the other decorations up though and we will get Daddy up the ladder outside to sort out the outdoor lights. Christmas music will be playing and I am sure it will be chaotic as everyone will be sooooo excited. Also on the agenda this week is finding us something to do on Christmas Eve. 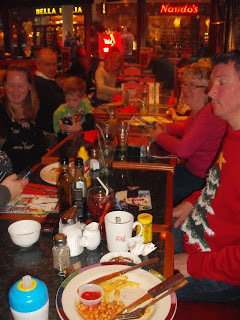 In the past Christmas Eve has always been that we go bowling then to Frankie and Benny's for lunch or early dinner. Its grown into a lovely family tradition, there are eight adults and eight children that go and we have a fab time. It passes the day quickly as the children are excited and waiting for Santa that evening and it gives them something to do. 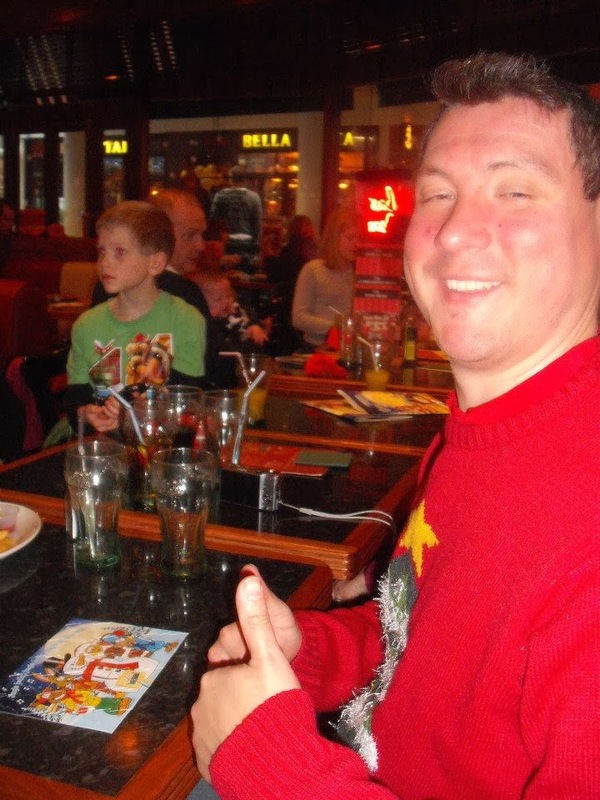 Frankie and Benny's is always kids eat free which is even better for us. Even with kids eat free we spend a good chunk of money on all of the adult meals and drinks etc...... and we always have a lovely meal and great service from our local restaurant. The children enjoy eating there as there is always something on the menu they like and everyone comes away happy and very full. My hubby giving Frankie and Benny's a Christmas thumbs up! Festive Christmas Eve family fun/chaos around the table at Frankie and Benny's. Everyone now full after a yummy meal and ready to go and win a game of bowling! 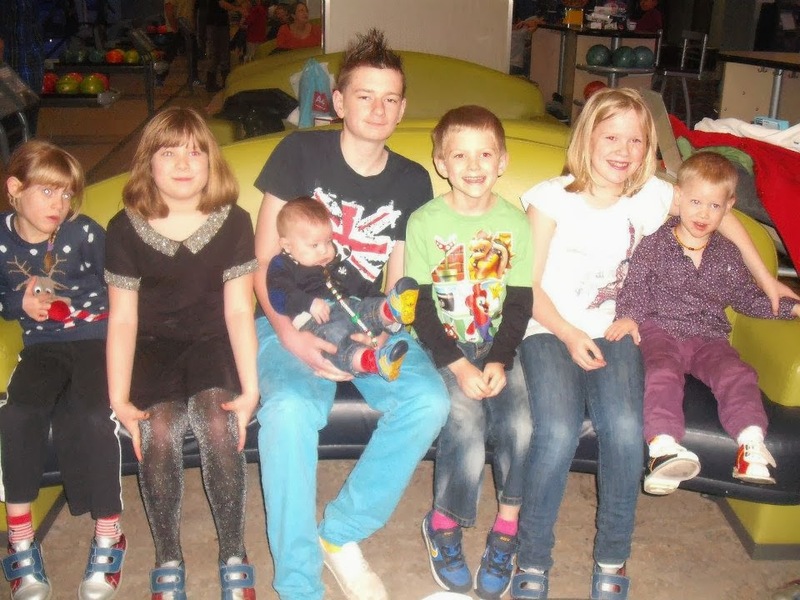 All the kiddies ready for their bowling game on Christmas Eve. I would like to point out that Frankie and Benny's are doing 'kids eat free' on Boxing Day and if you are out and about then head over and you get one child meal free for every adult meal you buy. This is unfortunately no good to us but hopefully lots of you can make use of this offer. Oh well, at least that will keep me busy this week. Searching out a restaurant to cater for us all. Mission accepted and all that! Amazon Black Friday offers started for anyone not on a spending ban! There always some good offers to be had and a few amazing ones too but you need to be quick on the 'Buy' button! So that's another blog post done. I'm off to keep myself busy so I don't end up on the PC again! Presents to wrap, housework to do. I'm sure there is a Christmas film on (or 2 or 3!) that I could watch. gNappies gJingle nappy and gLegs, scrummy! 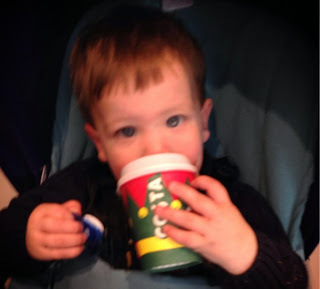 A cheeky Costa Coffee Babyccino, pre spending ban!!! Complete with festive cup.